Before activating your machine(s), you must create an organizational structure. 1. Navigate to: http://dashboard.voxel8.co and click the login menu selection at the top right of the page. 2. Enter in your previously registered Voxel8 email (see Picture 001-A) and password (see Picture 001-B) and hit the login button. Picture 001: Dashboard Login Screen. 3. 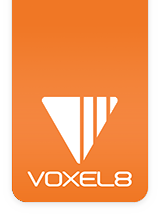 Once you are logged in successfully, you will want to register your new Voxel8 Developer’s Kit Printer. You'll do this by creating an organization and then adding at least one printer to it. Select "Settings" (see Picture 002) under the "Account" button in the top right corner of the Dashboard after login. Picture 002: Top menu of the Voxel8 Dashboard. 4. Create a new organization, by clicking the “New Organization” link (see Picture 003), entering a valid organization/company name to use, and then hitting the “Create Organization” button (see Picture 004). Picture 003: Creating an organizational structure for Voxel8 printers. Picture 004: A new organization is created. 5. You are now ready to add your Voxel8 printer to the organizational name that you just created through the Voxel8 Dashboard.